Robert Findling, MD, is a pediatrician and a psychiatrist. He is the Director of Child and Adolescent Psychiatry at Johns Hopkins Children’s Center, and Vice President of Psychiatric Services and Research at the Kennedy Krieger Institute. On July 31, Dr. Findling published a brief video (and article) on Medscape: Adverse Events Caused by a Drug Warning? In fact, to their credit, the mainstream media did not pick up the Lu et al study to any marked degree, though the NIH, who funded the study, did issue a very misleading, and at times blatantly false press release. But, back to Dr. Findling’s article. Dr. Findling confined his observations to the adolescents (10-17) in the study. Here are some quotes from his article interspersed with my comments. The key word in this last quote is “estimated,” which appears twice. Lu et al did not, as Dr. Findling asserts, find a 31% reduction in the rate of antidepressant prescriptions, nor did they find a 21% increase in the rate of psychotropic drug poisonings. Rather, Lu et al estimated these numbers. They graphed antidepressant use and psychotropic drug poisonings for 1.1 million adolescents who were enrolled in a consortium of group insurance plans. The data was graphed from 2001 (q.1) to 2010 (q 4). The black box warnings were mandated by the FDA in October 2004. 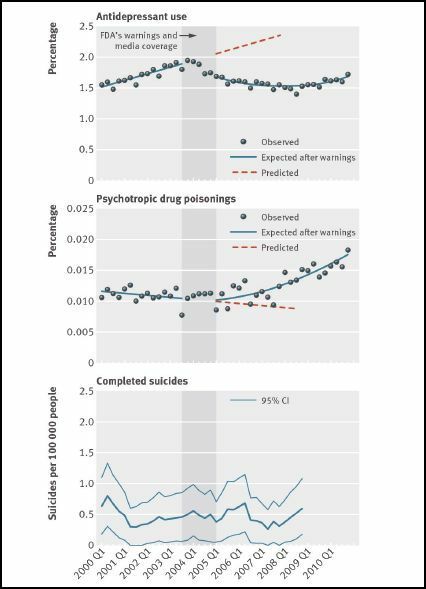 From the 2001 (q 1) to 2003 (q 3) data, Lu et al calculated trend lines for antidepressant use and for drug poisonings. They excluded from this trend analysis the period 2003 (q 4) to 2004 (q 4) on the grounds that this was a phase-in period for the warnings. They extended these trend lines for the second half of the study period, as shown in the diagram below. The orange dotted lines are the trend line extensions. In reality these kinds of short-term trend lines are notoriously unreliable, and the notion of assessing a percentage change against what might have been the case is fraught with potential for error. And incidentally, I’m not familiar with the term “counterfactual,” but Merriam-Webster’s Collegiate Dictionary (2009) gives “contrary to fact” as the definition. So perhaps Lu et al were trying to tell us something! What the data, for this particular group of adolescents, actually shows is that antidepressant use did decrease beginning about a year before the black box warnings. It is likely, but not certain, that this decrease was related to the publicized suicidality concerns, the FDA advisories, and the FDA warnings. But psychotropic drug poisonings remained relatively flat (with some fluctuations) from the beginning of the study until about the beginning of 2008. At that point the graph starts to climb. A critical point here is that one can manipulate trend lines readily by choosing the start and finish points for one’s study period. There is nothing in the Lu et al data to support an association (much less a causal link) between the reduction in antidepressant use that started in 2003 (q 4) and the increase in drug poisonings that started about the beginning of 2008. And even if these two variables were perfectly correlated, in the absence of additional evidence, there would be no reason to believe that the adolescents who didn’t take the antidepressants were the same individuals who were hospitalized for drug poisoning. Despite the cautious wording in the second item, there is a clear implication that psychotropic drug poisonings (ICD-9 code 969) can be used as a substitute, or proxy, measure of suicide attempts. In my earlier post, I drew attention to the fact that drug poisoning is only one method of committing suicide, and in many cases is not a suicide attempt, but rather an accidental overdose. I also pointed out that ICD-9 code 969 includes poisonings by caffeine, marijuana, amphetamines, and Ecstasy, overdoses of which are not, to my knowledge, often used as methods of suicide. Reference 34 is to an earlier Lu et al study, on the completeness of deliberate self-harm (E-codes) in commercial insurance plan databases. So the only reference cited in support of using drug poisonings as a proxy measure for suicide attempts is reference 33. This is a 2010 paper by Patrick et al. On July 14, less than a month after the publication of Lu et al, the BMJ published a letter from Catherine Barber, Matthew Miller (two of the authors in Patrick et al) and Deborah Azrael, all of Harvard School of Public Health. Here’s a quote from their letter. So, the very people that Lu et al were citing to support their use of drug poisonings as a proxy measure of suicide attempts, have not only repudiated this methodological decision, but have also cited evidence contradicting Lu et al’s primary finding. The Geddes et al editorial, copied dutifully by Dr. Findling, is a scandalously deceitful piece of psychiatric propaganda. In reality, the only significant consequence of the warnings emerging from the Lu et al study pertaining to adolescents (10-17) is a reduction in the use of antidepressant drugs in this particular group. There is no evidence of an increase in psychotropic drug poisonings, suicide attempts, or completed suicides. The essential dynamic in all of this is that the FDA’s warnings, which incidentally were long overdue, had a negative impact on pharma-psychiatry’s image, and on their business, but had no negative impact on client welfare. Nevertheless, psychiatry continues to resist the reality that their sacred drugs do in fact cause harm, and that the FDA warnings were needed. For psychiatry, business and professional status routinely trump client welfare. Psychiatry is morally and intellectually bankrupt. They have never had any intelligent or logical response to the criticisms that are being leveled against them, including the well-established fact that their so-called antidepressant drugs induce suicidal feelings and actions in some people, particularly children and young adults. They refuse to accept this because it contradicts their dogma. Instead, they use spin, propaganda, and fear-mongering to promote their drugs. Dr. ‘Funding’ is also on his way to the bottom chamber of the afterlife. Yes, Dante did predict where the unrepentant hypocrites would be going, didn’t he? It’s so sad, I had no idea so many doctors would be “going down;” I used to believe medical practitioners were respectable human beings. Thanks again, for speaking the truth, Dr. Hickey. Just a note not mentioned here about the antidepressants. In addition to increasing “suicides” and “violence,” they also provide a completely iatrogenic pathway to “bipolar,” since the antidepressants are also known to cause “mania.” And the US doctors are MISDIAGNOSING (according to the DSM) this ADR of antidepressants in staggering numbers – resulting in iatrogenic harm on an almost “unfathomable” scale. I agree. This is far more common than most people realize. And, of course, psychiatry then has more pills for the “bipolar”. What a travesty! And I believe the medical research is now showing that the long run outcomes for the medication compliant “bipolar” patients are resulting in long run outcomes, exactly as seen in the medication compliant “schizophrenia” patients. How long will it take the psychiatric industry to figure out that it is the drugs that are causing these horrendous long run outcomes in their scientifically “lacking in validity” disorders? Psychiatry is all about creating iatrogenic illnesses in other human beings for profit, but they call these iatrogenic illnesses “life long incurable, genetic” “mental illnesses,” with zero scientific evidence. They’ve even created a “bible” nicely describing the symptoms of their iatrogenic illnesses. And they’ve been creating iatrogenic “mental illnesses” in their patients with their toxic drugs for 60 years now, isn’t that long enough? Swallow that bitter pill, psychiatry. Philip, Thank you for applying your gift of critical thinking and sharing it with the rest of us parents with a loved one in the system. We are so busy just surviving from day to day, fighting to keep hope alive, that we don’t have time to read the scientific propaganda and take apart the bogus scientific arguments piece by piece. You give me some hope that there is some meaning in the word ‘PhD’ and that maybe the next generation of ‘PhD’ candidates will not fall over themselves racing towards the monetary rewards of their education without giving real consideration of what is lost, when professional put money, comfort, and security ahead of true scientific inquiry and analysis. My daughter lost of many of her human rights and much of her hope for a full recovery in part because of what she was told by well educated people who drank the poison kook-aid of the medical propaganda funded by the pharmaceutical industry. I’m sorry to hear of your daughter’s “treatment.” We truly have a long uphill battle ahead. Psychiatry has made it clear that it will never relent voluntarily. It’s about Spin and Public Relations. There’s a huge industry behind the drug pushing that goes beyond the pharmaceutical companies. Most psychiatrists are so enured in prescription writing that they are not qualified at anything else – if this goes they’re done for. There’s also a secondary industry developing right now out of the psychotropic industry : A diabetes/heart disease/obesity/ cholestero/blood pressure, control industry. This false economy wants to survive as well. The education industry also, depends on ‘organic brain’ research (that goes nowhere) to subsidize their Universities. All these groups are dependent on ‘mental illness’. Yes. The spurious philosophy has its tentacles everywhere, and is destroying not only individual lives, but the culture of resilience and striving on which our civilization rests. Wow. That is great you got your son out! I pray your son will enjoy a speedy recovery from all the psychiatric drugging and incarceration. How traumatizing for our kids to be incarcerated in a locked unit for years, isolated from their friends and family, and forcibly medicated with ‘medicine’ that makes them worse!! I definitely can relate to your son as I observed as every new medicine forced on my daughter brought a range of new symptoms ranging from voices, OCD, seizures, catatonia, tremors, mania, violence, etc. Can you believe that that supposedly educated doctors have no other way of ‘diagnosing’ other than trying every drug under the sun and see how the ‘disease’ progresses? If our children become compliant, regardless of the fact that they are emotionally frozen, numb, and zombie like, that is considered recovery! Over three quarters of my daughter’s ‘disease’ symptoms were directly attributable to iatrogenic harm and drug side effects but here in the US, parents like me don’t dare dispute the Holy Priests of the Medical World. Think of what happened to Justina Pelletier! The parents get labeled with medical child abuse! Isn’t it frustrating that you had to put so much of your energy into simply getting your son out of the clutches of your son’s oppressors? Wouldn’t you rather have spent the same resources on his college education, housing, or real treatment? Best wishes. Thanks for reaching out. I love this community. I’m sorry for what your family, especially your son, went through, but congratulations on getting your child freed. Now, have hope, and give your son lots of hope. I, too, was grotesquely miss-medicated for three and a half years. I was given an IQ test shortly after, and did just as well after the drugging, as prior. My main issue now is really being “shell shocked” / disgusted by the fact that what happened to me, to proactively prevent a malpractice suit, has happened to millions, I guess, due to a different form medical greed. But somehow, it’s much worse when you realize it’s happened, and still is happening, to millions – especially children. I will recommend you research drug withdrawal induced super sensitivity psychosis, because that will possibly be a difficult situation you’ll have to face, if you wean your child off the drugs. That doesn’t last forever, though, and it’s not a “return of the initial ‘disease’,” it’s caused by withdrawal from antipsychotics. And it can happen much later than the medical community currently claims. But above all, have hope, and provide hope and unconditional love to your child. Overcoming the medical betrayal may likely be the worst long run symptom your child has. Someone Else, Thanks for pointing this out – Super sensitivity withdrawal syndrome. Its like an overflow of emotion (Fear) that floods the circuits and hijacks the system. Once the overflow levels off, the system comes back to normal. If a person understands this then the battle is won (Withdrawal is frightening). Practical psychotherapy like CBT, Stress Management, Buddhism worked for me. It seems we need to help ourselves, since the doctors are either ignorant and egregiously misinformed, or disingenuous and greedy. Or, most likely, some combination of both. And I think super sensitivity withdrawal syndrome is different for everyone, in my case it took the form of a “manic” awakening to the story of my un-conscience / dreams. But the story of my dreams is a really cool story, not actually scary. However, since my husband and I had been lied to by doctors, and neither of us was informed of this potentially serious withdrawal issue, he was confused by it. And it was “like an overflow of emotion … that floods the circuits” for me, and confusing since we had not been forewarned it may occur. And, of course, it ended up being misdiagnosed by subsequent doctors. I do understand from my research, I’m likely the exception, however, and super sensitivity withdrawal is scary for most people. But once you get through it, one can heal. If drugs are needed, the absolute minimum, for a very short period, are best. Otherwise, the process of weaning and withdrawal syndrome starts all over again. And my research indicates the fewer times this happens, the better the long run outcome. Someone Else, I have to agree. I have naively thought that I could work with some doctors in the psychiatric system (especially those within my faith community). But today I have to confess that I was wrong. A fellow believer posted this story to their FB page: http://t.co/2B0flD6dTD. I pointed out that it was a nice recovery story and wondered about the child’s withdrawal from Seroquel. I also pointed out that for the last 4 years, Seroquel has a warning about eye problems associated with it. I was unfriended. I had been warned before that I could not post anything that might make the parents of his patients feel guilty (the mother of the child is a minister of word & sacrament and acquainted with guilt and recovery from it). I also suspect that I may not post anything that might inform the parents of his patients. I am so sorry for you and him. Keep the faith – you’ll get it figured out, with or in spite of the doctors! I’m sorry for your son and your familys’ troubles. “beserk ….massively unwell and uncontrollable, unlike anything he had been before, with a host of new symptoms” – this is exactly what withdrawal syndrome is. After a few months I was in begging for the medication. another word for it – akathesia. Thanks for this reminder to not give up. At times it feels like we’re just banging our heads against the wall, but we are seeing small victories that would never have happened twenty years ago. I don’t know if I have used this quote in a comments section of one of your articles before. Forgive me if I am repeating myself. “People with intelligence will use it to fashion things both true and false and will try to push through whatever they want with their clever reasoning. This is injury from intelligence. Nothing you do will have any effect if you do not use the truth.” Hagakure. I really appreciate your work which points out this “injury from intelligence” and those who are involved in doing it. Findling goes on the list of those who are not prepared to use the truth, and who will in the end have no effect, and be discarded to the dustbin of history. Why do I have an image of Findling running naked through a cherry orchard, basket in hand? I hadn’t heard that quote before. Thanks. It’s very fundamental. Do we see other people as objects to be exploited, or as fellow travelers to be helped? Actually Dr Hickey you have pointed out one of the most used rorts in the public service right there. Exploit people, and if exposed, use the “good faith” defense. An example, I’m wondering what happens when I give someone a fist full of lithium, and a fist full of seroquel every day. So I do it and it all goes wrong. Any questions, I was only trying to help them. Works virtually every time. Most people aren’t aware that where an act of negligence occurs (by act or omission) the “good faith” defense is not valid. I see your question as an integrity test. When exploitation and helping coexist all is fine, it’s when they come into conflict and a choice must be made that the true character of an individual is tested. Personally I go with my heart and do my best to help. I know others who tend to be a little more ruthless. Take care, and I look forward to your next article. Thanks for writing this……I think its important to challenge corporate psychiatry’s lies, and pay ops.. A medical license shouldn’t be a license to kill. Well, that’s business— measure loss against projected gains. This is a tactics which is widely used also on social media. I have posted comments and discussed psychiatry on various forums and under related articles and after a while there always appears a person who goes into – “you’re an irresponsible, bad/stupid person who is discouraging people from seeking needed (scientifically proven and based in slid science) help and when they commit suicide it will be your fault” (the language is usually more sneaky but the message is more or less this way). Then I have to dig up a reference for every claim I make or write up a lengthy explanation only to have it commented “well, you raise some important issues but nonetheless … you’re an irresponsible, bad/stupid person who is discouraging people from seeking needed (scientifically proven and based in slid science) help and when they commit suicide it will be your fault”. It’s so ridiculous that it’s almost funny. I only hope that there are some people out there who after reading such a thread come up to the right conclusions.